David Bomberg, The Mud Bath, 1914. Oil on canvas. Collection of the Tate, London. Purchased 1964. Image © Tate. For all that the Vorticist movement was aggressive and explosive in its own time, history has not looked upon it with such fervour. Overshadowed by Futurism; it’s Italian contemporary, Vorticism has lain in wait for a moment to shine. Now that moment has arrived, and where better for Vorticism to have the chance to stand on it's own two feet than the country that produced their biggest rivals, the Futurists; Italy. From today, until the 15th May 2011, The Vorticists: Rebel Artists in London and New York, 1914 - 1918 will be on show at the Peggy Guggenheim Collection in Venice. The exhibition will be the first devoted to Vorticism to be presented in Italy, making this a landmark event for the movement. Vorticism was an important, modern British art movement. Occurring at the beginning of the 20th-century; a time when the threat of war and the toll of modern industrial developments were in play, the Vorticists embraced modernity and celebrated the role of the artist as a calm and meditative spectator of modern life. From this vortex; the calm at the centre of the madness, the Vorticists produced abstracted figurative images of modern society. Led by the ever-controversial character, Wyndham Lewis, the group included painters such as William Roberts, Helen Saunders and Edward Wadsworth, along with sculptors Henri Gaudier-Brzeska and Jacob Epstein. The group also included photographer Alvin Langdon Coburn, whose Vortographs were first shown in London in 1917, and are considered to be the first abstract photographs. Together, the Vorticists developed a style, and mode of thought, that has left us with some of the best commentary on one of the most pivotal times in history. The exhibition in Venice takes a view of the movement that highlights its Anglo-American connections and the exhibitions that were mounted in the early part of the 20th-century. 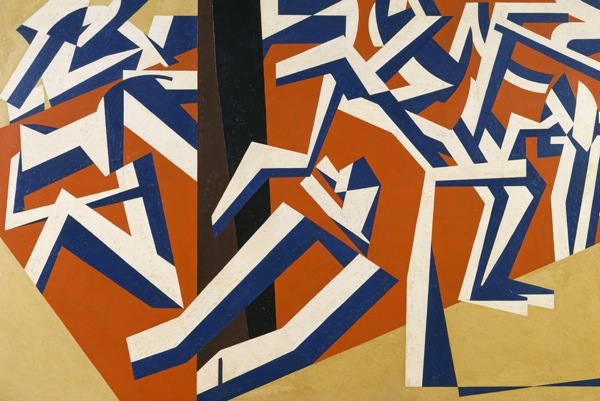 Put together by the Peggy Guggenheim Collection, in collaboration with the Nasher Museum of Art at Duke University and the Tate Britain, the exhibition looks set to shed some new light on the Vorticist movement, and hopefully find it a new generation of fans.